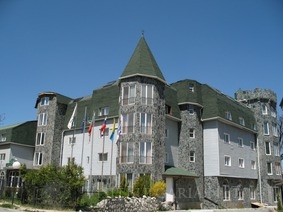 Chateau Vaptsarov hotel in Bansko ski resort in Bulgaria. - 7=6 during 10 Dec - 03 Jan; 17 Jan - 23 Jan and 24 Feb - 09 Mar 2018! - 10=9 and 14=12 for all arrivals! Location: Chateau Vaptsarov Hotel is Canadian style hotel situated in a picturesque and tranquil part of the town of Bansko offering direct mountain views. At the same time the hotel is conveniently located only 700 meters from the gondola lift and all amenities, shops and bars are just 5-10 minutes walk. The hotel is popular for group gatherings and families as combines all the amenities of a standard 4 star hotel. Accommodation: Hotel "Chateau" features 19 Economy Double rooms, 33 double standard rooms, 8 deluxe double rooms, 7 family rooms, 4 junior penthouses and 3 suites. The apartments consist of a large room, children's room and two bathrooms. In the main room there is double bed, sofa bed and an option for extra single bed. The children's room is furnished with two single beds. All rooms are equipped with extra bed, TV, telephone, fridge, hairdryer and everything necessary for a pleasant mountain holiday. You can enjoy the spectacular mountain views from the deluxe rooms situated in the tower of the hotel. All the facilities in the hotel provide perfect opportunity for pleasant mountain recreation. Conference facilities: The hotel features a conference hall for 100 people suitable for conferences, team buildings, dancing and other social gatherings. SPA centre: The spa centre of the hotel, equipped with heated indoor swimming pool (water 30C) , fitness centre, Jacuzzi, sauna and steam room offers wonderful opportunities for enjoyable pleasant time and relaxation. You can choose one of the various recreational programmes and massages offered by specially trained and qualified therapists in the hotel. Entertainment: For the billiard lovers the hotel offers the opportunity to use the pool table in the lobby. Sports and cultural groups are offered the opportunity to use the multipurpose hall for sport activities and entertainment. You can take advantage of the natural grass pitch in front of the hotel for a football game or other entertainment. Children are offered a variety of entertainment, outdoor swimming pool, playground and games. Bars and restaurants: All guests can enjoy food either in our restaurant or in our Bulgarian style tavern ‘Mehana’. You have the opportunity to choose between our pub-style restaurant or traditional and local dishes in the Tavern. During summer months you can enjoy specialties offered directly from the barbecue bar, located next to the outdoor swimming pool of the hotel. You can always enjoy a cup of coffee or drink in front of the fireplace in the lobby or to surf the internet while enjoying the comfort of the wide open space and the relaxing music in the lobby-bar. Services: The hotel offers a shuttle-bus taking guests directly to and from the gondola lift which is only 3min drive from the hotel, ski hire, ski-school. The hotel offers free parking for 80 vehicles.